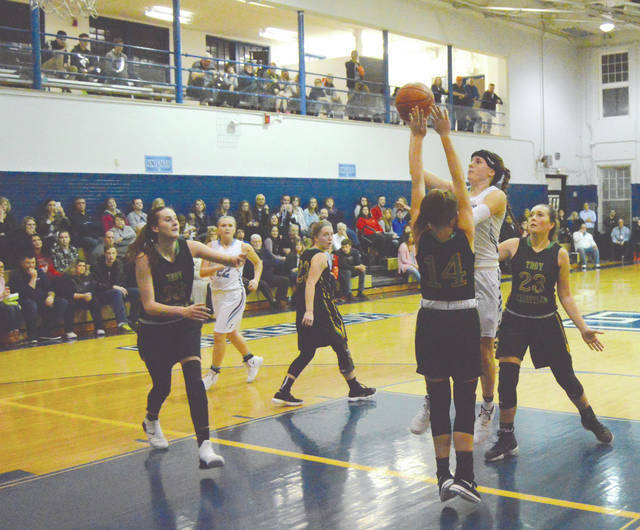 Legacy Christian senior Emily Riddle scores the 1,000th point of her career, Feb. 7, in the third quarter of the team’s 53-20 win over visiting Troy Christian. Kathleen Ahner puts up a shot over the Troy Christian defense in the first half of Thursday’s Metro Buckeye Conference girls high school basketball game in Xenia. 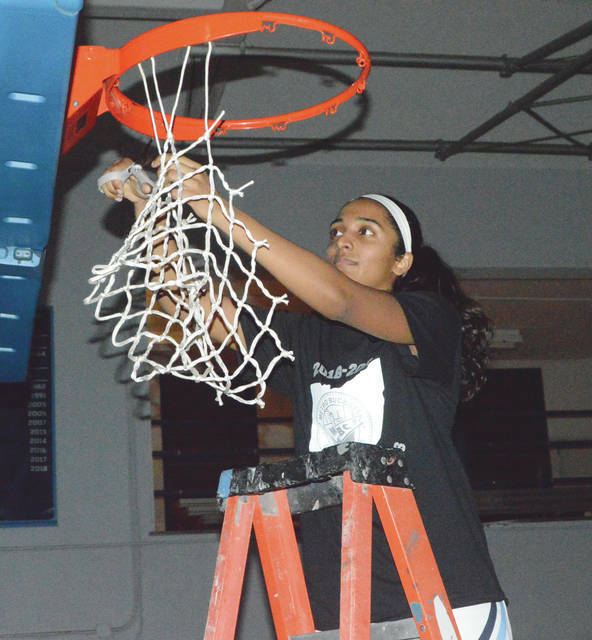 Legacy Christian senior Danielle Matthews cuts down the net after the Knights 53-20 Metro Buckeye Conference clinching win over Troy Christian, Feb. 7 in Xenia. 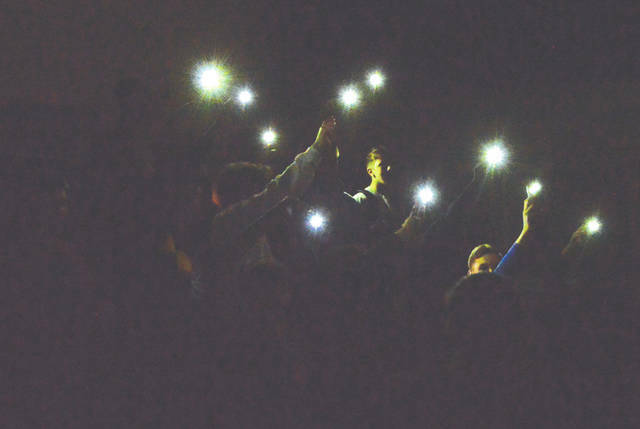 Legacy Christian Academy students turned their phones’ lights on to help light the court for the girls basketball team, as they celebrated Thursday’s 53-20 win over Troy Christian. The power went out moments after the game ended. 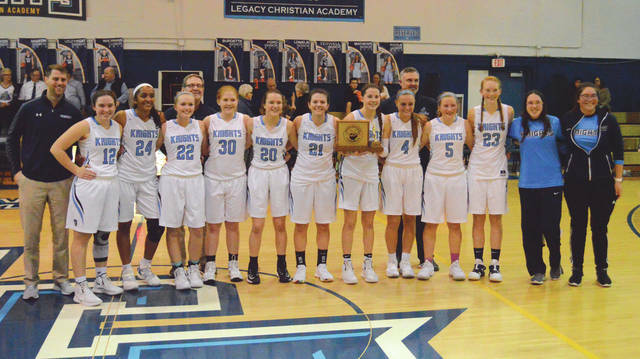 Members of the Legacy Christian girls high school basketball team pose with the Metro Buckeye Conference championship trophy after their 53-20 win, Feb. 7 over Troy Christian in the Xenia gym. XENIA — While a wind storm was knocking trees down on the Legacy Christian Academy campus outside, the girls basketball team was busy whipping up a “Perfect Storm” storm of their own. 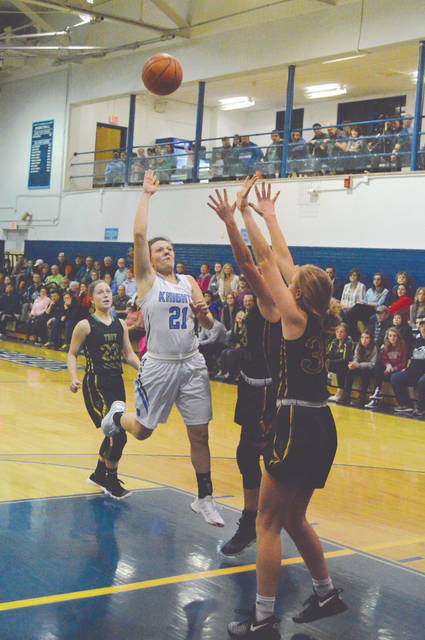 In a battle for the Metro Buckeye Conference title, the hosts outscored second-place Troy Christian by a 29-4 margin in the first half, then rolled to a convincing 53-20 win, Feb. 7, in the Knights gym. A large tree had fallen onto the main entrance way to the LCA grounds while the game was going on, and moments after the game ended the power went out, but that didn’t stop the Knights and their fans from dancing in the dark. With the LCA students lighting the court with their phones, the team cut down the net in celebration. Adding to the Knight’s fun, senior Emily Riddle scored her 1,000th career point with exactly three minutes remaining in the third quarter. By then, all that was left to do was celebrate as Legacy led 41-6 at the time. Riddle said she saw her sister had bought some poster board for the game, and that was her first clue that she was close to the milestone. Riddle led the Knights (19-2, 11-0 MBC) with 14 points scored, Kathleen Ahner and Emma Hess both finished with 11 points, Margaret Kensinger scored 10 points and Maddy Combs scored seven. Ahner said Thursday night’s win won’t be forgotten any time soon. Eagles sophomore guard Morgan Taylor led her team with nine points, six of which came in the second half. Freshman Sydney Taylor finished with six points, sophomore Erin Schenk added four points, and junior Alexis Salazar hit a free throw for Troy Christian’s points. With the loss, Troy Christian fell to 16-4 overall, 10-2 in the MBC. Coach Anthony Ferraro and his team left the Knights gym while the power was still out. Both teams have one more regular season game left on their schedules. Legacy Christian will play a make-up game at noon on Saturday, Feb. 9 against Miami Valley, while Troy Christian will host Chaminade Julienne for a non-league tussle at 7 p.m. Monday, Feb. 11.